Day 56 arrived and it was time to prepare to head out and farewell Byron once again. Another farewell was also the order of the day; it was time to say goodbye to the youngest member of Trek 2010, Walter James. After almost two months on the road as a support to the group and assistant to his Dad, Harry, Walter was going up to Brisbane to fly out to New York where he was going to be meeting his girlfriend Renae and having a ten day holiday in the ‘Big Apple’, a far cry from trekking in the outback of Australia for two months!! Saying goodbye is never easy but doing so with Walter touched us all. Here was a young man of 31 who, two months earlier, walked in to Cumber’s shed in Dongara (having arrived ahead of Harry) not knowing any of us and saying ‘I am here to join you on the trek to Byron Bay’. We all know how you must have felt at that point Walter (“what have I got myself into here with all these oldies”). Not only did you sort Harry out but you were such a capable assistant to all of us at one time or another. Thank you Walter. The TREKKERS OF 2010 would like to formally put a challenge to you now Walter, being that you are one of the youngest members of the club. We challenge you, that in the year 2020 you do another re-renactment of the 2000/2010 trek from Seep Point to Byron Bay. We would hope that we might all be lucky enough to be able to join your trek but that remains to be seen!!! You have proved to be a very capable young man and we are sure you would be up to meeting this challenge. We all wish you well in your future and hope you are having a great holiday. Farewells said we started on our return to Western Australia by the Bruxner Highway via Bangalow, Lismore, Casino and on to the small town of Drake. Having again crossed the mountains we felt the chill factor once more. On reaching Drake we were invited to park on the helicopter landing pad at the back of the hotel/motel! This helicopter was used in emergencies in a similar manner to the flying doctor in these areas. Being advertised as ‘Home of the Golden Harley’ of course Harley’s featured in the decor but not only Harley’s, the proprietor Bob Kane and his wife Desley have some of the most amazing memorabilia throughout the hotel. For anyone travelling in the area, it is certainly worth a stop to browse. As it was Friday night several locals and visitors gathered and there was a very generous raffle held (ongoing fundraising for the helicopter service) which we all enjoyed supporting. Allan was a lucky winner, taking off one of the very nice meat trays which would become part of our supplies for the trip home. We also enjoyed a lovely evening meal and breakfast during our visit – thank you Bob and Desley. After a chilly ‘pack up’ at Drake on day 57, we continued on into Tenterfield some 50k’s uphill and down dale through some very heavily wooded areas still travelling on the Bruxner Highway. During this section we crossed the Great Dividing Range at a height of 888m just prior to arriving into Tenterfield. One claim to fame that Tenterfield acknowledges is that Banjo Patterson married a local girl. A quick coffee and ‘check out’ of the town was enjoyed before we continued on the New England Highway to Deepwater. At Deepwater we left the New England Highway and took a lesser road heading west out to Emmaville boasting a population of approximately 300. As has been said many times 9G’s (and their drivers) love getting off those highways!! 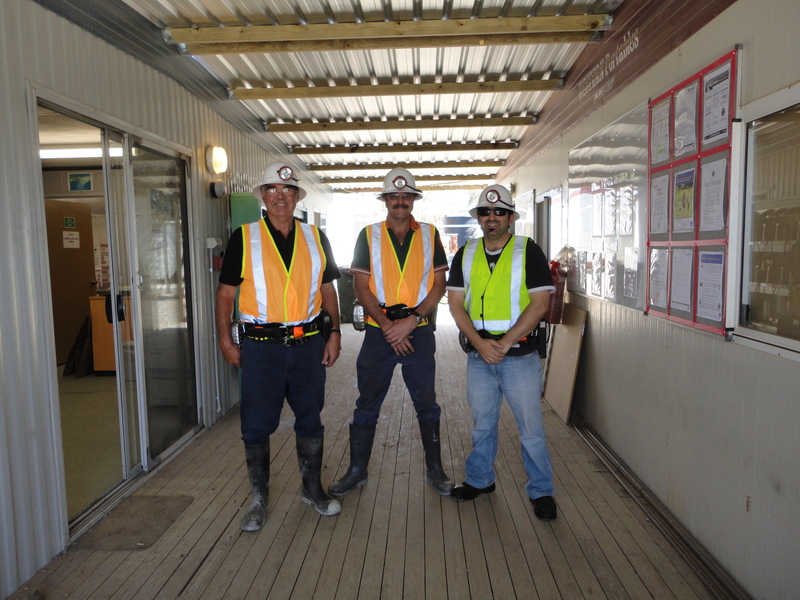 Our stop at Emmaville allowed time for lunch and a tour through another wonderful mining museum put together and manned by locals. When travelling throughout our great country it is a great pleasure to enjoy the many special collections of ‘our past’ and learn what took place in different areas all those years ago. 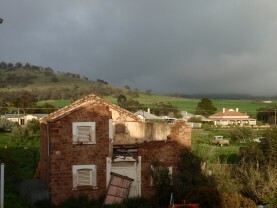 The locals were telling us that they had had the wettest season in very many years which was a wonderful boost for them. The story of the ‘wet’ continues to follow us on our journey but we are still aware that there are places that have missed out on this joy and our hearts went out to those folk. From Emmaville we continued on the unsealed, well maintained back roads passing through the large centre of Inverell. Here we then went on to the Gwydir Highway then on to an alternative route heading to Bingara. The wildlife excitement for the day was seeing an echidna crossing the road – safely thank goodness. We made camp at a picnic site some 20k’s from Bingara having done 247k for the day. We had now done 6976.6k’s since leaving Dongara. 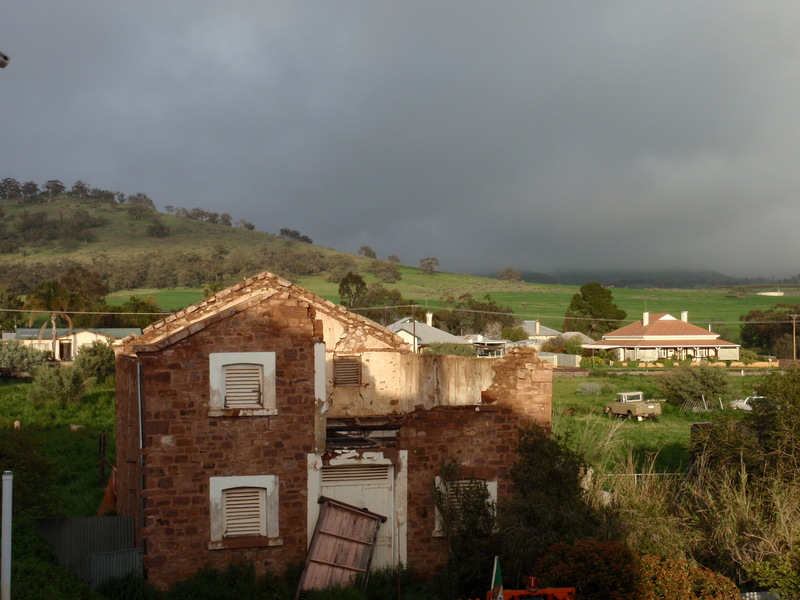 At 8am on day 58 – 29th August – we left camp and headed in to Bingara. We must mention that we had certainly passed through ‘kangaroo country’ during the past two days. It is strange how wildlife comes in patches! 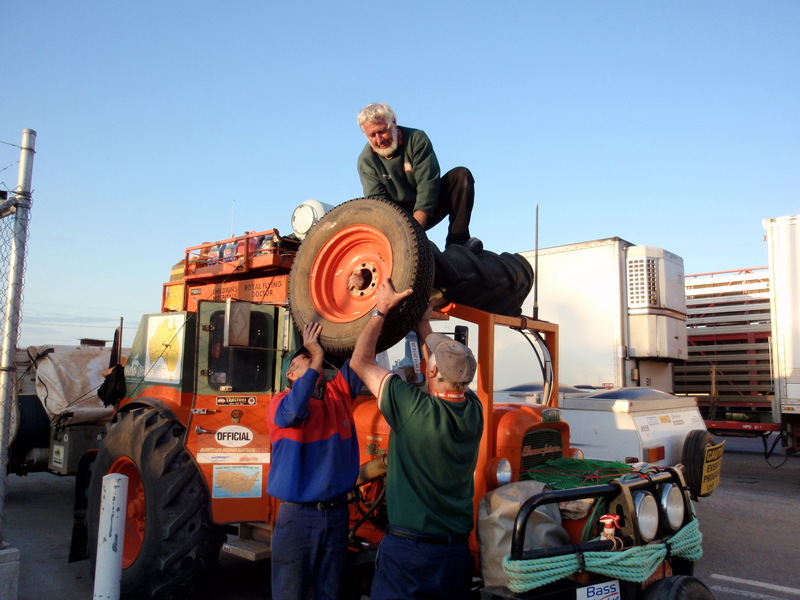 Bingara gave us the opportunity to top up with fuel and gas before we continued on across to Narrabri. The route chosen gave us more hill climbs and vast valleys through beautiful Australian bushland dotted with bright golden wattle. Then it was on into cropping and livestock country. 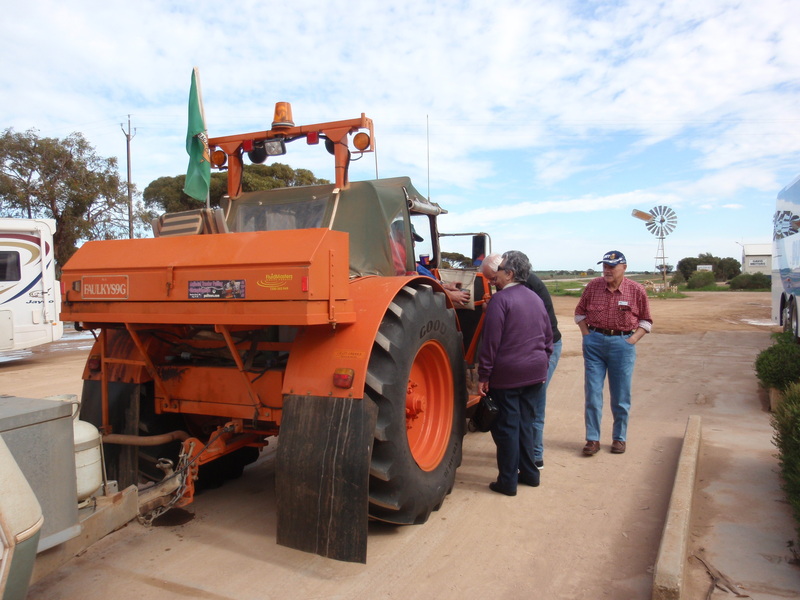 The farming fraternity of the group certainly enjoyed what they saw with the various crops and those of us not involved in the farming side of things enjoyed learning from the ‘experts’. The fast flowing creeks that we passed made a lovely sight too. Several of them were actually flowing over the road but nothing to what we had to cross in recent weeks. On the other side of one of the largest valleys we were back into ‘mountain climbing’ and then a decent with wonderful views all round. With some 30k’s to go in to Narrabri the countryside again flattened out now with mountains either side of us as we travelled along. We were also back into a large cotton growing area. Apart from what we could see growing in the fields, there was always a ‘dead giveaway’ with cotton puffs on the road and roadside having fallen from the hauling trucks. After this great drive we reached the Newell Highway with 4k’s into Narrabri and lunch!! As we left Narrabri Allan did a radio interview for a local station then we headed to the CSIRO Australian Observatory between Narrabri and Wee Waa. This was yet another place to learn, this time about astronomy – not something that can be learned in one visit though but very interesting all the same. As we were about to leave this centre, Neville (Eastern Branch President) and Jenny Thompson arrived. They had travelled up to meet us at Wee Waa for the night so being aware of which route we were taking decided to intercept us along the way. For all of us it was great to meet up again and we then had them as our ‘support’ into Wee Waa. We all enjoyed a beautiful Chinese meal together at the local Club with lots of chatter and catching up over the table. A great night was had by all. Day 59 began by farewelling Neville & Jenny, thanking them for making the big effort to just ‘pop in and say hello to us’. It was great guys. We then did a pre-arranged interview and photo shoot with a local media representative before heading in to the main street where we had to farewell another member of Trek 2010. Harry left us at this point to head down to Tamworth to visit family before going north in to Queensland again to catch up with friends and form his ‘team’ for the drive back west in about a month. Again farewells are not always fun; we knew you had a special purpose in joining us on Trek 2010 Harry and we were pleased to have been part of the team that saw you complete your mission Mate. We also knew Jock would have been so proud and as you often said he would have been watching over you. Safe travels Harry. On leaving Wee Waa we made our way out to Pilliga Bore – pumping hot water since 1902 – wow, this would have to be a true oasis in the outback. Anyone planning a trip into this area should mark it as a ‘must’. It was a wonderfully set up place with provision for campers or day trippers. There was a great warm pool, shower and toilet facilities with all water supplied from the ongoing bore. We certainly would have made it a campsite had it not been so early in the day. Leaving Pilliga, we took an alternative route to Walgett – plenty of roo sightings on this track. One road side sign caught our attention as well “Come by Chance” appearing to be the name of a small historic village. Along this route we passed through some very large crops including canola, wheat, barley and faber beans. These crops were the best that Faulky had ever seen. 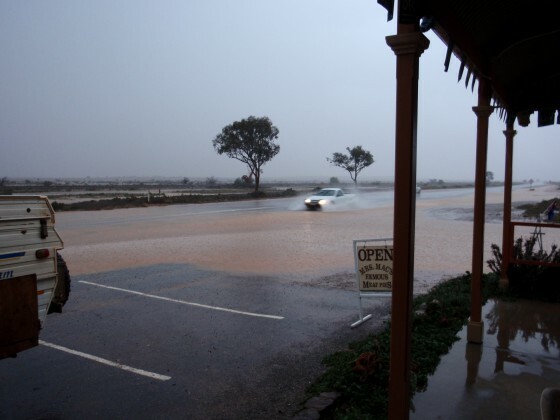 Another reminder of what flooding can do in these areas was seeing the levy banks around the town of Walgett (these were also observed at other towns we passed through). Our camp site for the night was near Wombat Creek off Bush’s Road. We had now travelled 7364k since 3rd July, 2010. Day 60 we enjoyed getting a nice little haul of yabbies from the creek in the morning, so cooked them up before leaving camp at about 8.15am. Our next planned stop would be at Brewarrina. 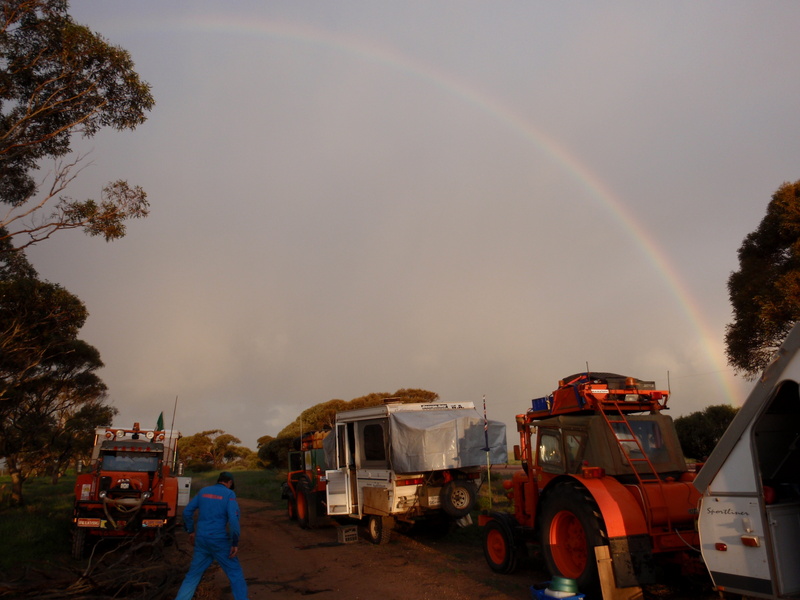 Prior to our camp at Wombat Creek and on into Brewarrina we were still seeing all the signs of recent rains and flooding but fortunately none of this would cause any problems for us. Emus were the major sightings for the day – many, many, many! At Brewarrina, Anita from the local region newspaper joined us over coffee for a story and some photos. She also told us of the magnitude of the floods in the area on the last New Year’s Day. Again this was another town with levy banks for protection from rising waters. The Barwon River through the town still has the remains of the historic fish traps used by the indigenous many years ago but unfortunately because of the height of the river at present they were not currently visible. From Brewarrina we went on to Bourke and visited the ‘Back o Bourke’ interpretive museum, after which we continued on towards Louth on the Bourke-Wilcannia Road. As we travelled along we saw the large dams and canals supplied from the Darling River for irrigation. We were now travelling on what is known as the Darling River Run. Again we continued to see so many emus as we travelled along. Around 80k’s out of Louth/30k’s south west of Bourke we made our first camp on the banks of the Darling River and enjoyed our yabby catch for dinner together. Day 61 saw us all up and ready to leave camp at 7.40am!! There was talk of rain coming although it truly was a beautiful morning. A few k’s down the road the country side changed to red dirt again – a colour we had not seen for a while. Still the increased sightings of emus continued along with goats. 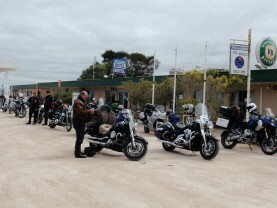 Our morning tea stop was at Louth where we passed on a greeting to the Licensees from Salty who we had met at Toompine. Louth was yet another town with levy banks for protection from the vast flood plains. As we read all the historic information along the way – one particular reference took our attention, that being that when the Darling is in full flood, it can be up to 80k’s wide!!!!! That really is beyond all imagination. Travelling along the Bourke-Wilcannia Road we often saw deserted homesteads – some of quite substantial structure – and ponder “where did the people go, how did they live” all those years ago in such harsh conditions and “what caused them to move off”? Drought years would no doubt have had a bearing of course. With lots of thinking time as we tonk along in our 9G’s, wonderful stories and ideas can be concocted!! 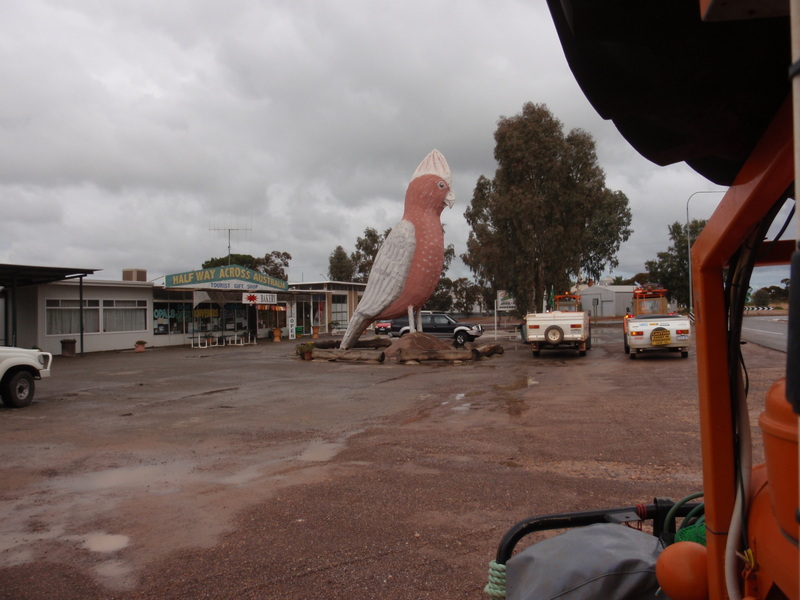 The weather took a warmer turn as we approached Wilcannia – the forecast for the day was 30 degrees there. This would be the warmest we had experienced since leaving Dongara. We had lunch at Tilpa then continued on the west side of the Darling River. Some 20k’s out of Wilcannia we found a great camping spot where the Paroo River joined the Darling River. We had been told to try and see this area as it was the first time the Paroo had been flowing for many years and locals believe that as history goes it is a once in a life time phenomenon to see it – again we feel so lucky and privileged to be here at such a special time. 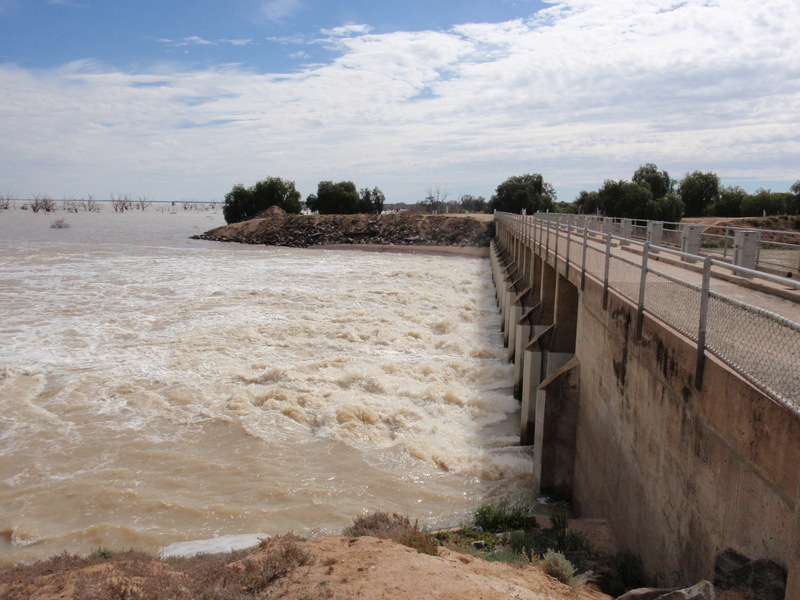 In going to this point we were also told to take note of how the Paroo River had gouged the banks of the Darling River at the entry when both rivers were at their peak recently. We noted that point and then as we were setting up our camps we heard ‘cracking’ sounds and some ‘banging’ on the river’s edge. At the time we could not be sure what had caused it but later when exploring the river banks we found that the edges where breaking away and falling in to the water in many cases exposing the massive root systems of some very large, very old trees – guess this is just nature at work. With such great surroundings to camp in, we all enjoyed another shared camp oven dinner before turning in for the night. September 2nd, day 62, we left this special camp site at 8.15am and did the last 20k’s in to the small town of Wilcannia. 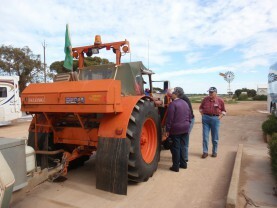 A local indigenous gentleman, named Waddi, aged around 60years, greeted us when we got out of our tractors and having been born and bred in the town had a wealth of information to impart. He was so interesting to talk to. He spoke of the early river boat days and tunnels under the streets for delivering to the businesses from the boats. Those early days must have been bustling both on the river and in towns like Wilcannia. We also chatted with Greg and Robyn Stephens from Warren in New South Wales who arrived at the same time as us in their restored army jeep having just completed a ‘trek’ with their club. The “small world” bit came in to this conversation with some of the 9G’ers knowing some of their trekking companions as well. 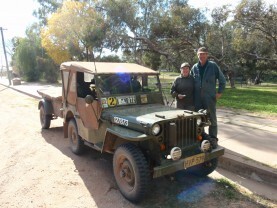 From Wilcannia we took the bypass road down to Menindee Lake. 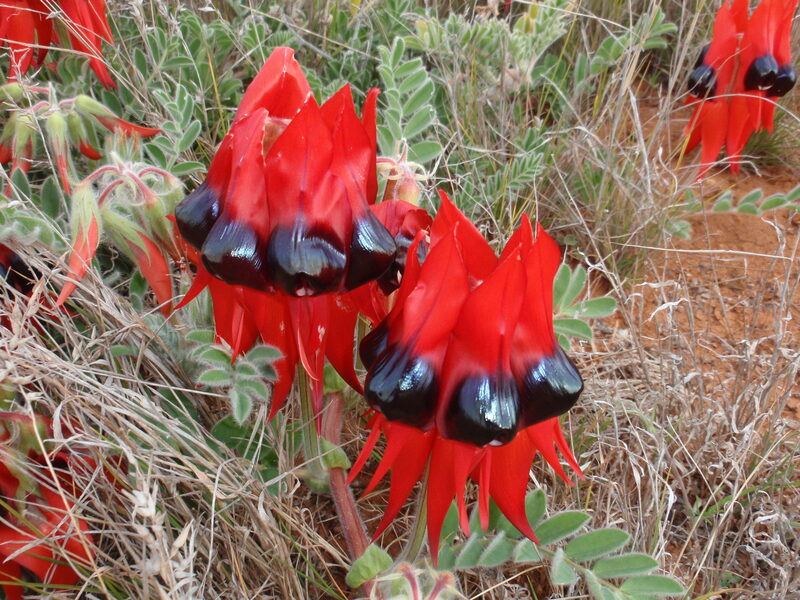 The red colour was still prevalent in the surroundings and the area even took on the appearance of small sand dunes with the wild flowers and green foliage being more or less the same as what we had experienced when crossing the Simpson Desert. In addition, sun flowers began to dot the road side creating a lovely contrast. We passed by a vast amount of dead grape vines so could only assume it was a venture that may have possibly failed through times of drought. 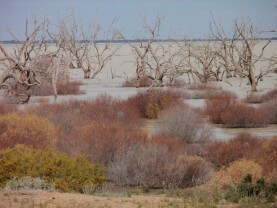 Arriving at Menindee Lake was yet another moment of great interest. We went to the lookout where the overflow from the Darling River enters the lake, the roar and force of the water was incredible. 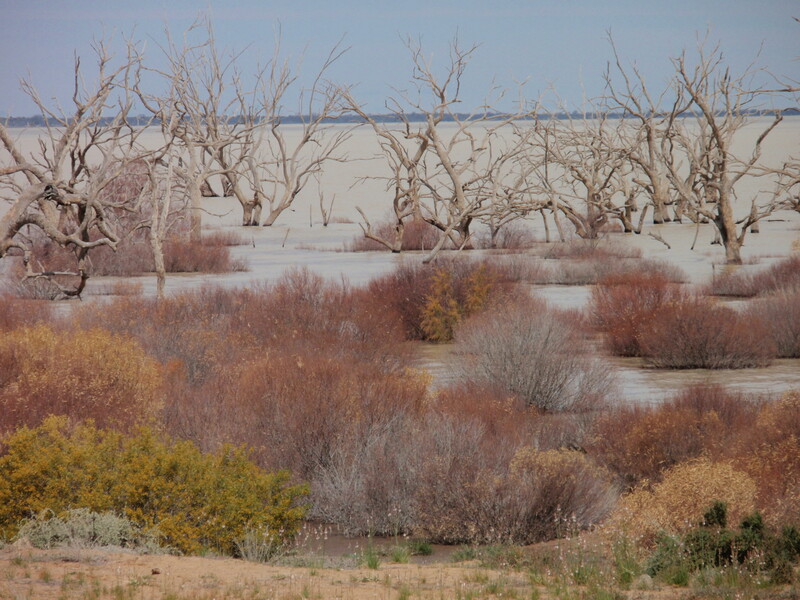 Menindee Lake was – at that moment – an amazing expanse of water. 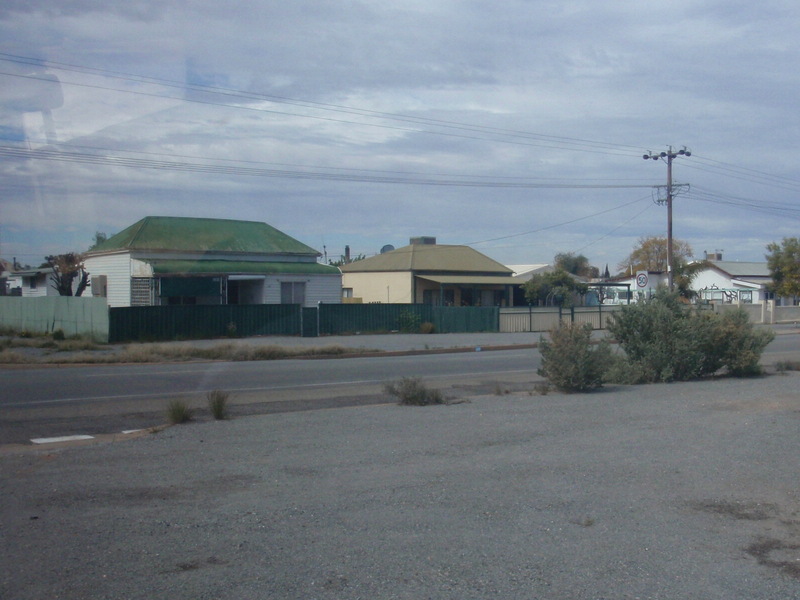 We took the 13k drive in to Menindee town and were quite taken by the entry statement sign which gave a population of 980 but over the top of the 0 was placed a number one – we could only assume that a baby had been born to someone in the town recently! 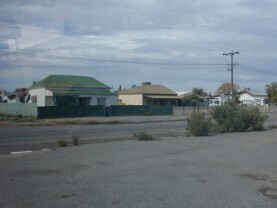 Our next destination was to be Broken Hill for our overnight camp and sightseeing. 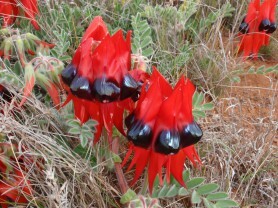 As we travelled along it was a delight to see the Sturt pea’s growing wild – a good photo shoot. 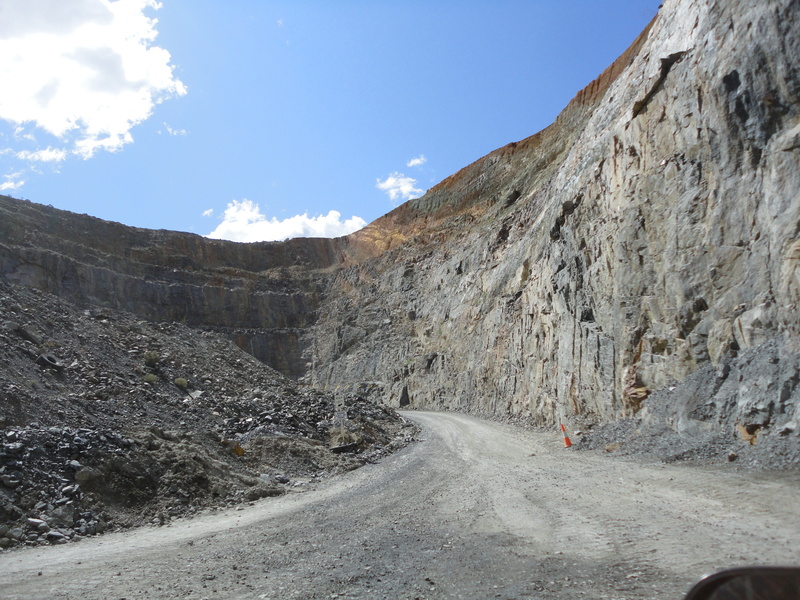 Prior to arriving into Broken Hill all our telephones and GPS’s automatically changed to central time – isn’t technology great?!! 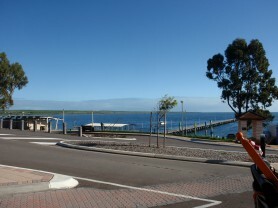 We checked in to the Lake View Caravan Park and all had a fairly early, quiet night.